Fagus sylvatica 'Rivers Purple' is often considered the best purple Beech clone and has some of the darkest foliage of the Fagus family. 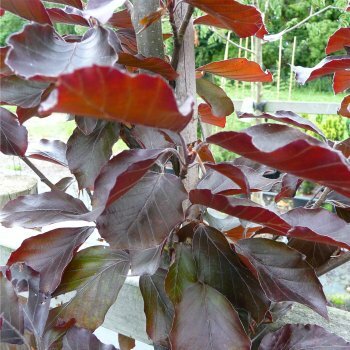 The large leaves begin red and turn to a deep, almost black purple when planted in full sun. The foliage then turns bronze, red and gold in the autumn. The tree itself is broadly spreading, reaching 10 x 6 metres in 20 years but can be kept smaller by pruning if desired. This stunning purple leaved Beech tree is tolerant of exposure and will grow in most soils except wet. Where the space is available, 'Rivers Purple' makes an astonishing grand looking feature. When planting beech trees, such as Fagus sylvatica Rivers Purple, it is important to prepare the planting area well. Pot grown beech trees can be planted at any time of the year. You will need to carry out the following to prepare your planting site.